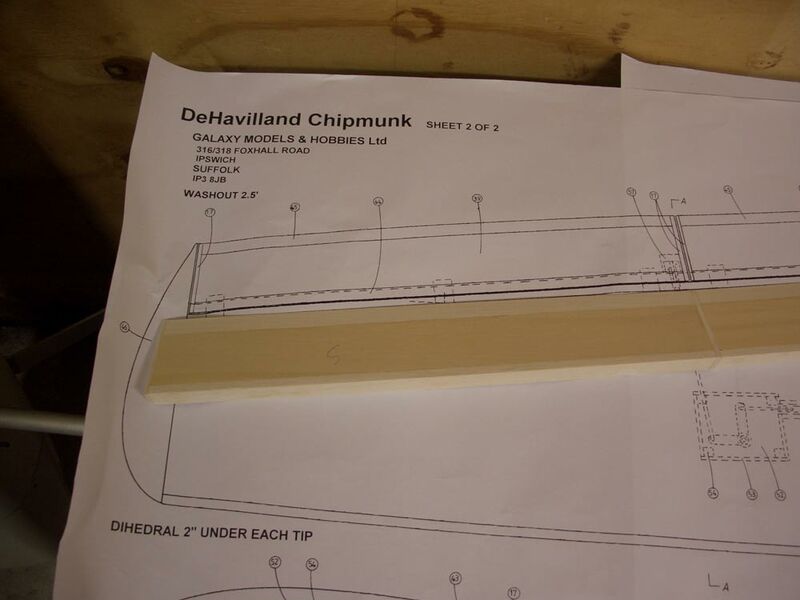 Welcome to my build of the Galaxy Models Chipmunk. I intend to loosely follow the instructions and won't dwell on the standard build, but I will highlight any deviation from the instructions and try to explain why. 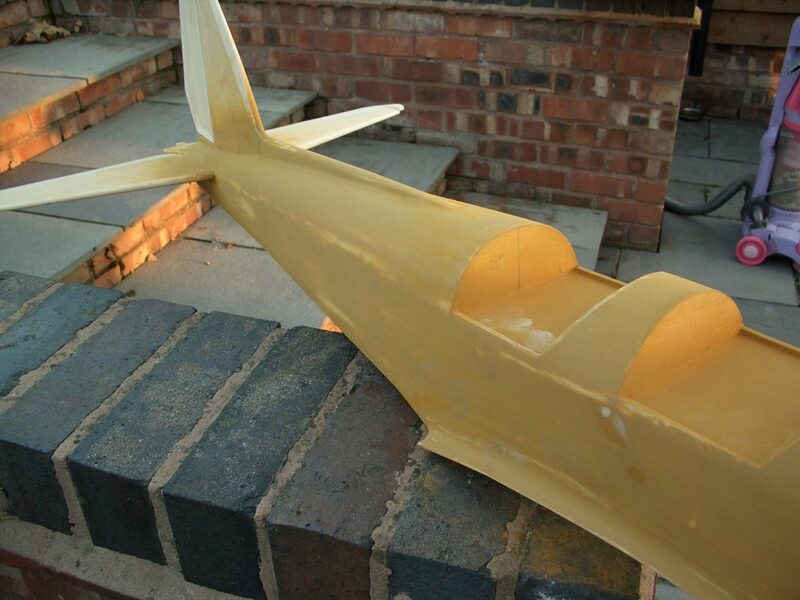 Fuselage sprayed and the tail filmed, not quite as per scale but close enough. The wings as far as I have them, run out of red profilm so waiting for a trip to Penn Models for some more. 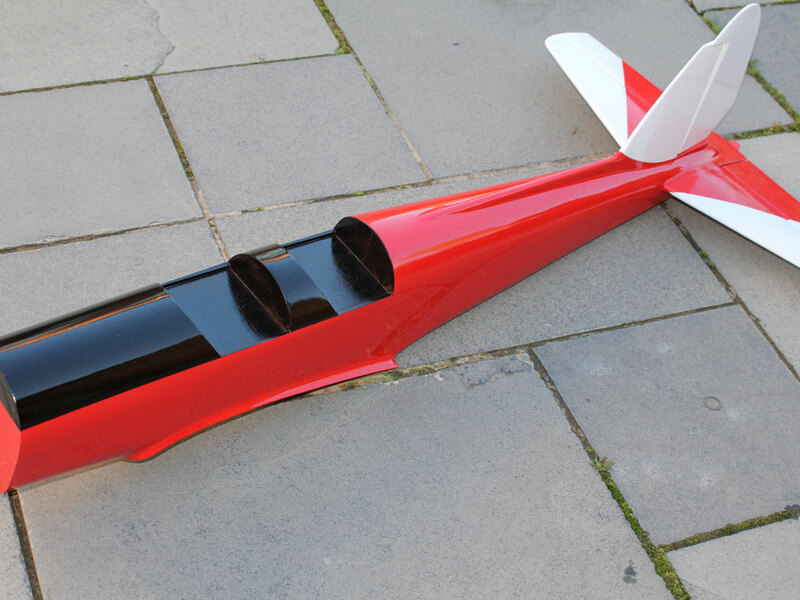 The fuselage will be sprayed with Spectrum Red paint and the wings will be Profilmed. 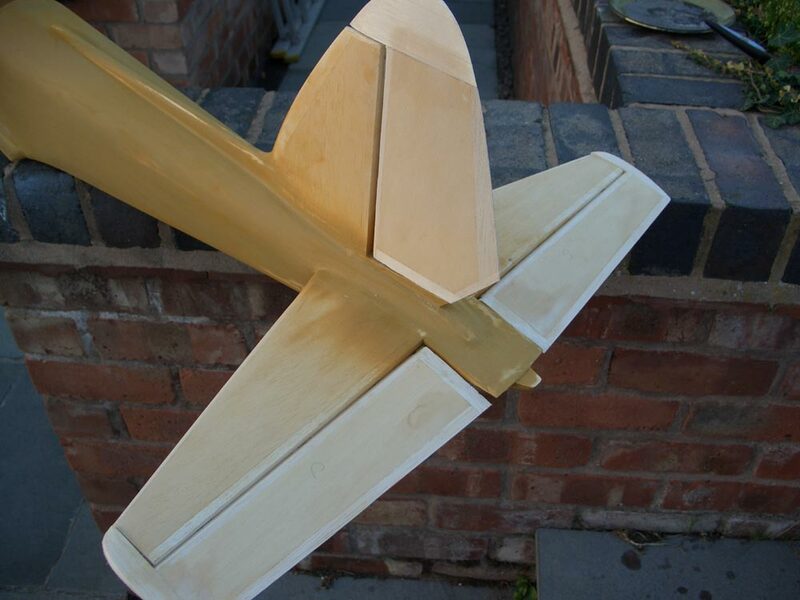 All control surfaces have been trial fitted and tested. A bit of a jump here. 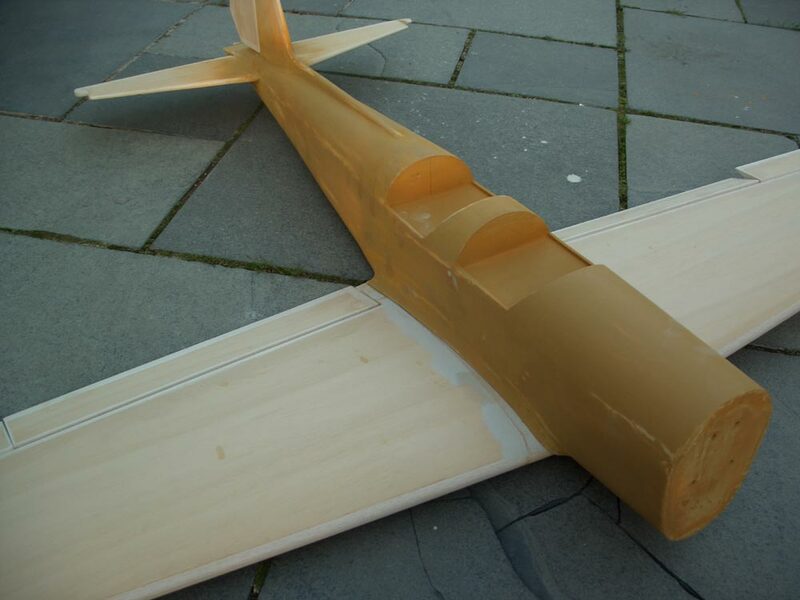 fuselage was shaped & sanded and covered with glass cloth applied with PolyC. What a nightmare it took 10 coats to fill the weave, a whole large can of primer filler to get to a smooth paint ready finish. This was a trial run before I cover my DB big Spitfire, and it think I'll cover that with epoxy or tissue & dope. 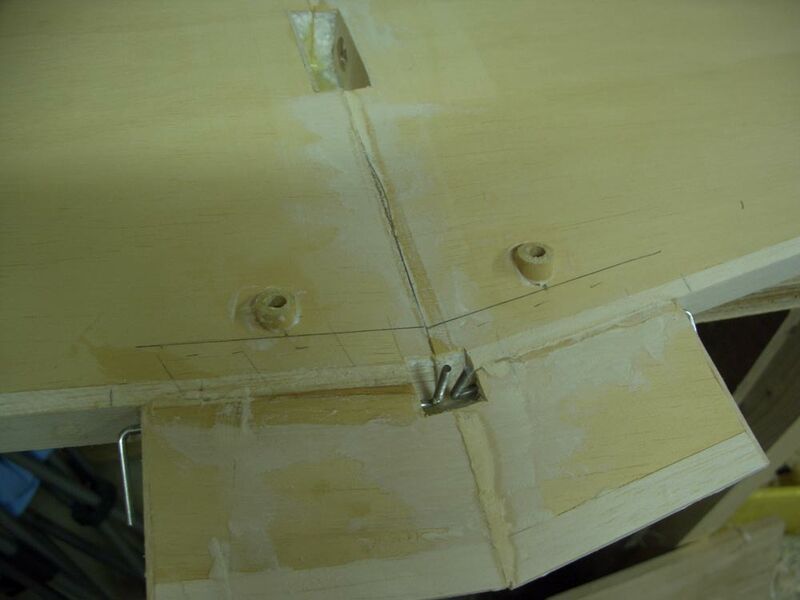 I had trouble getting the fin fairing to fit properly, in the end I discarded the supplied ABS one and used balsa. A lot easier to fit, and it still looks scale. 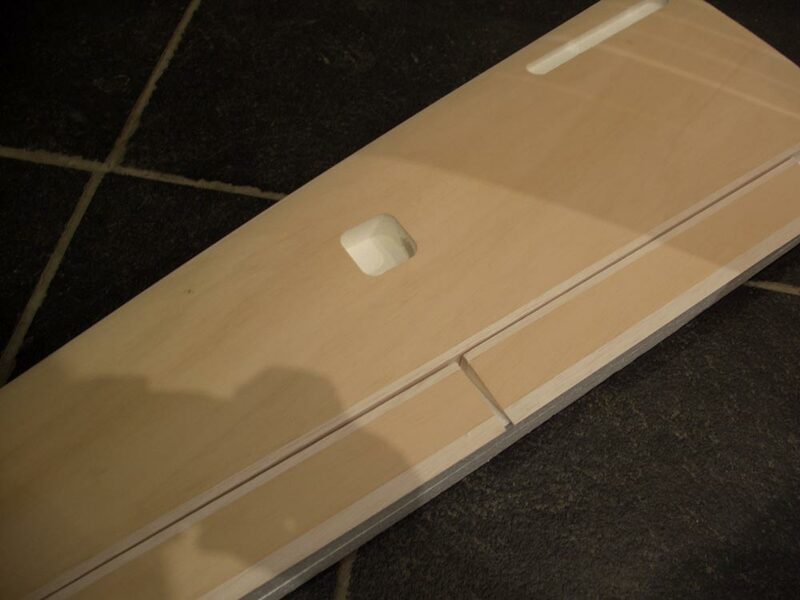 Elevator and rudder controls fitted. 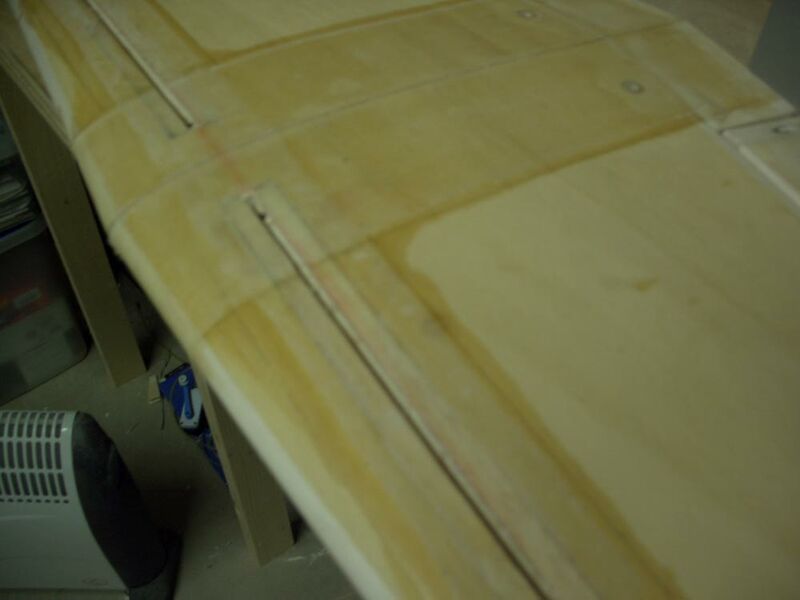 The 3rd shows the tailplane centre section fitted and marked out for the ABS cone. 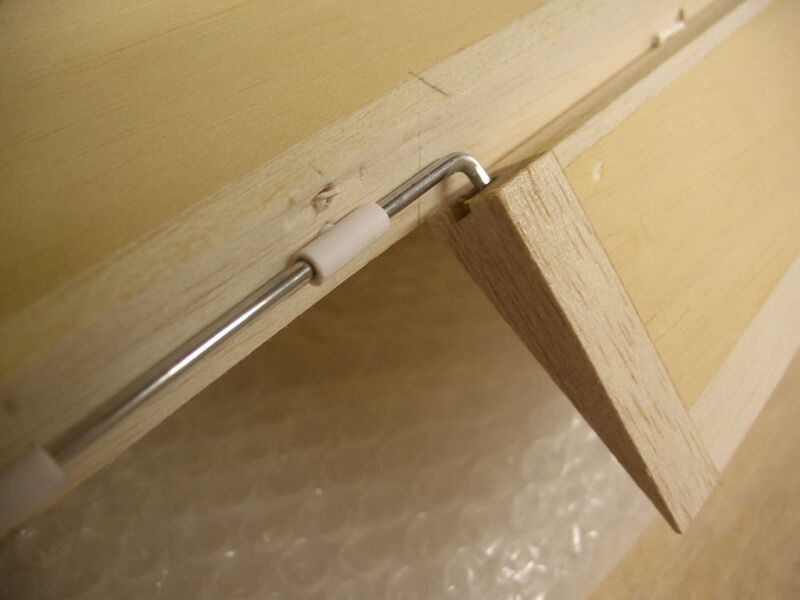 Also note the recess to eliminate any ridge. On first fitting of the tail to the fuselage it the incidence was way off, about 3mm in measurement not sure what that angle is but I'm sure someone with trig will tell me. 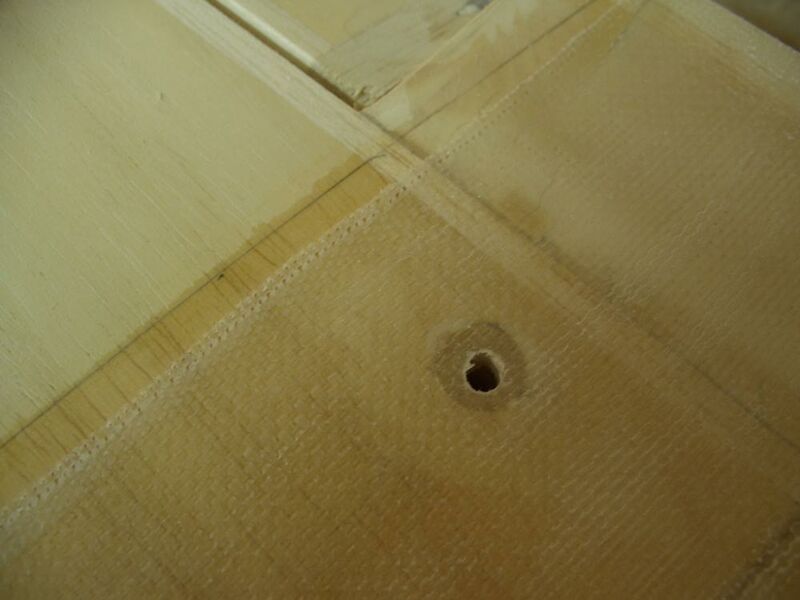 No problems though I just stuck some 3mm sheet over the fuselage and made good again. 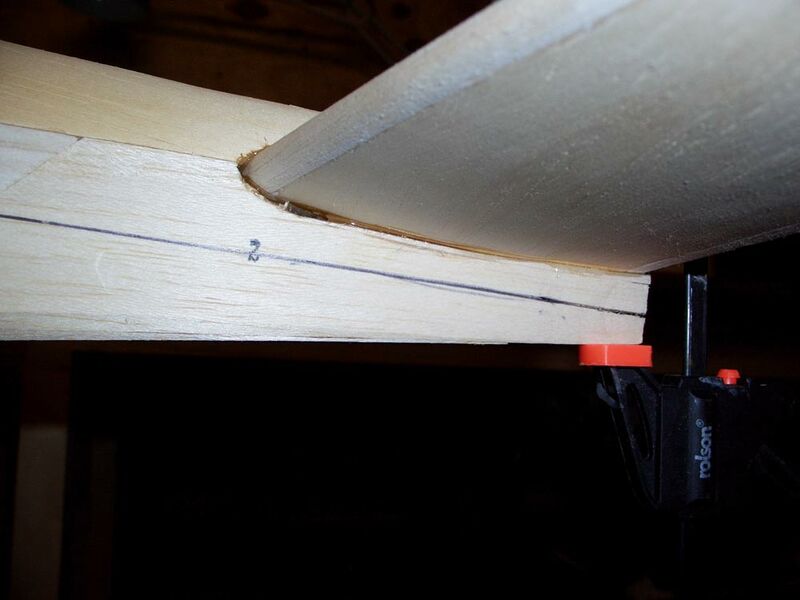 You can see the line above - this is the zero incidence line and used to set the tail plane incidence. If I hadn't of check it, I would have the tail mounted with the equivalent of 3mm down elevator. 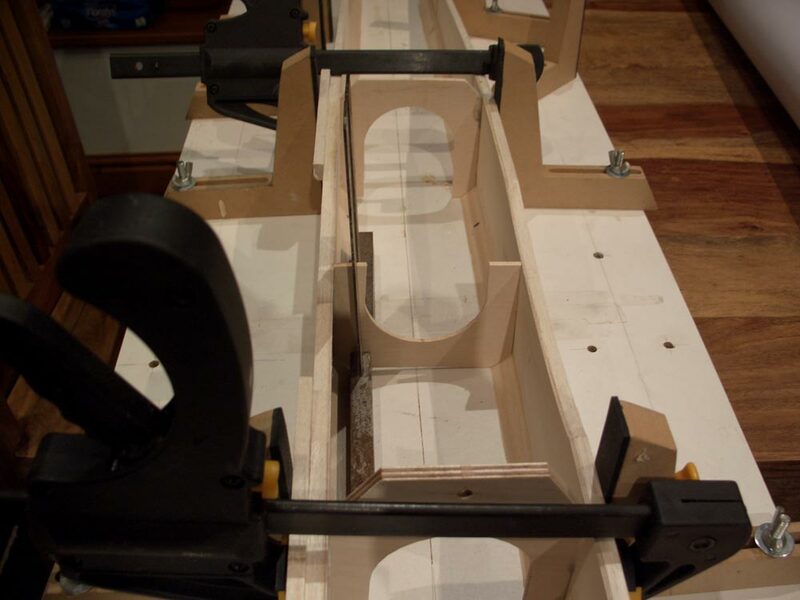 The final image just shows the routing and mounting of the control snakes. Now if following the instructions I should already have the bottom in place and shaped. 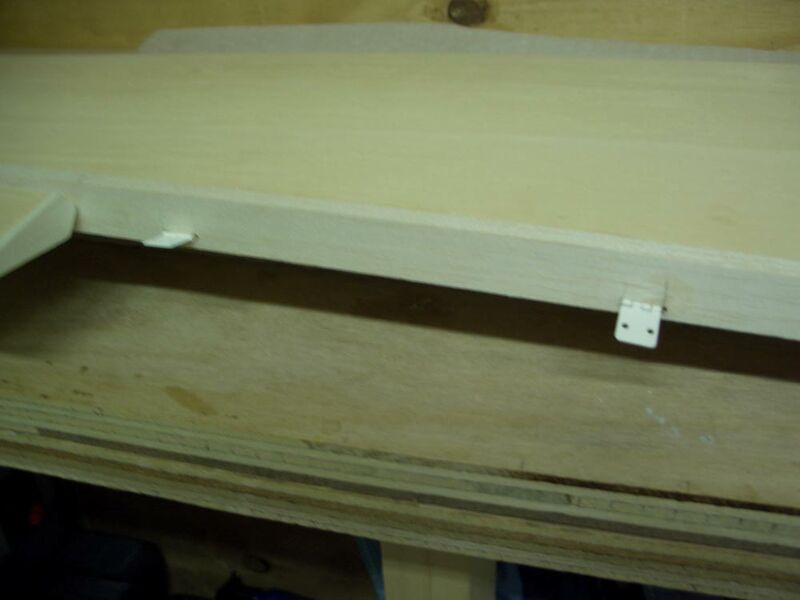 But I don't want the trouble of a hatch here, so I'm going to fit all the tail end controls and then sheet, If I ever get a problem in the future, it will require surgery to fix, but how many times has this ever been required. The instructions now are out of the window. To make things work 'My Way' from here on in I'll be going solo. 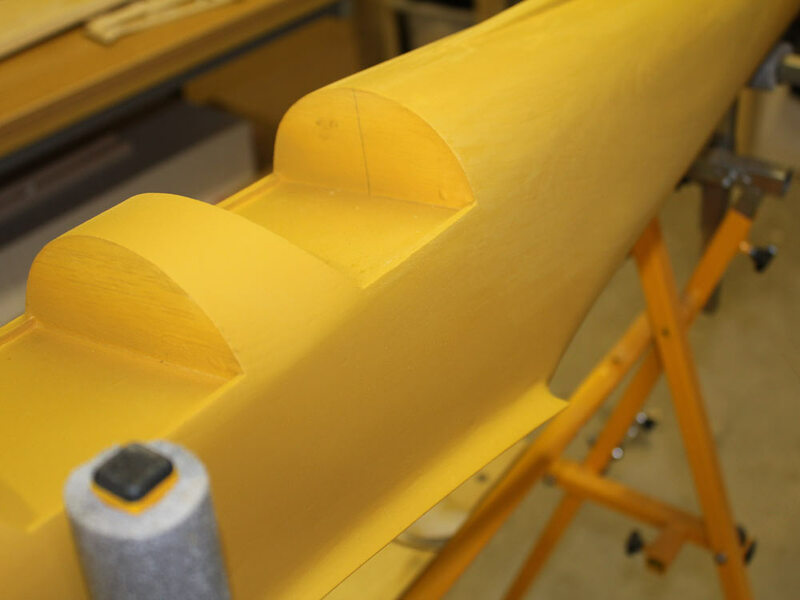 Firstly the wing mounting blocks are not identified so I'm using the 2 off 1/4 ply destined for the cowl (did I say I've ordered a Carbon Copy one - more on that later) , and fitted them across the fuselage in a more traditional setup. By eye I marked the position on the fuselage and took and angle measurement from the wing and epoxied it in place, I've also added a support to give just a little more area for the glue (I know it would have been more effective the other way, but I wanted to keep the mount close to the wing seat. 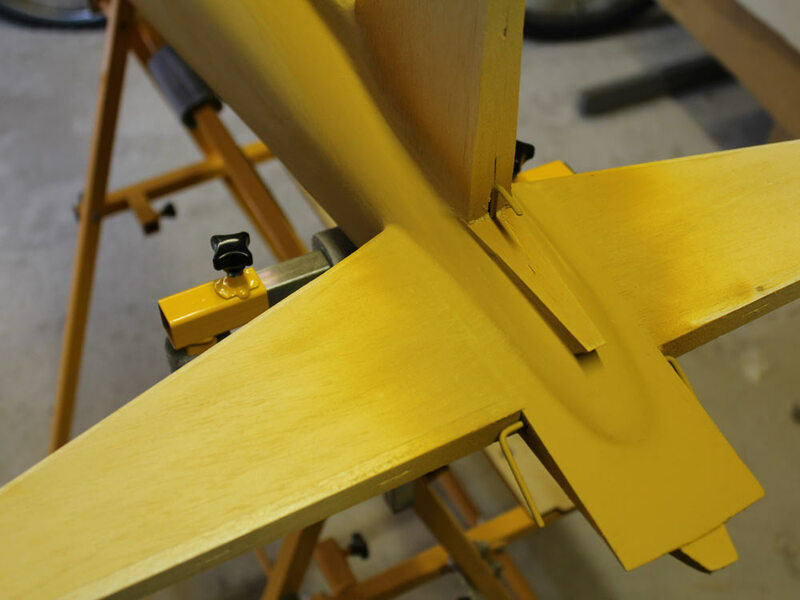 Before gluing the wing was checked for incidence and alignment, then it was clamped and the screw holes drilled through the wing and into the block, using the already fitted wing hard points as a guide to get the angle right. Unfortunately the block was say 3mm too far back that I didn't feel comfortable using the captive nuts (they would be over the edge, that I drilled and tapped the holes 6mm to accept the wing bolts. Once tapped I ran some thin cyano into the thread, and re tapped, and repeated one more time. This is a method I've used before with great success. 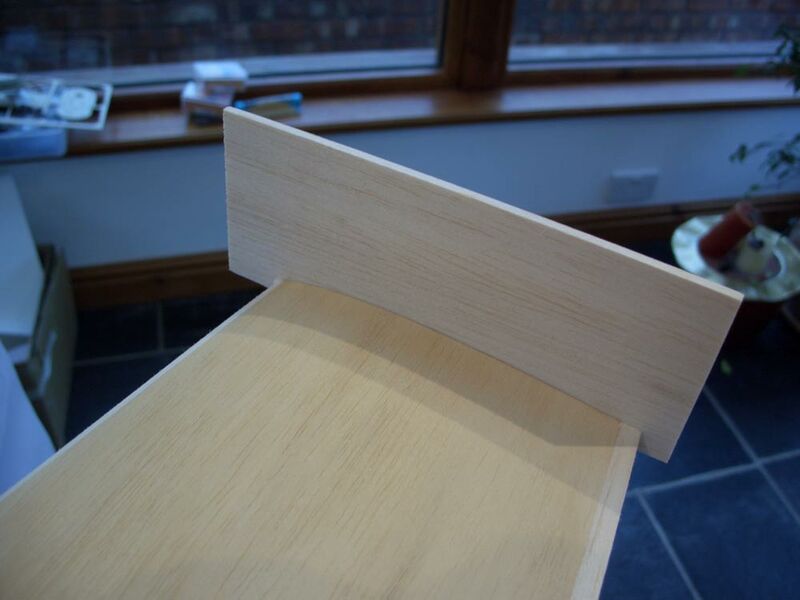 Also fitted here are the ply wing fillet bottoms. The Great Mate is really useful for holding the model while getting the wing (and Tail straight and at the right incidence. 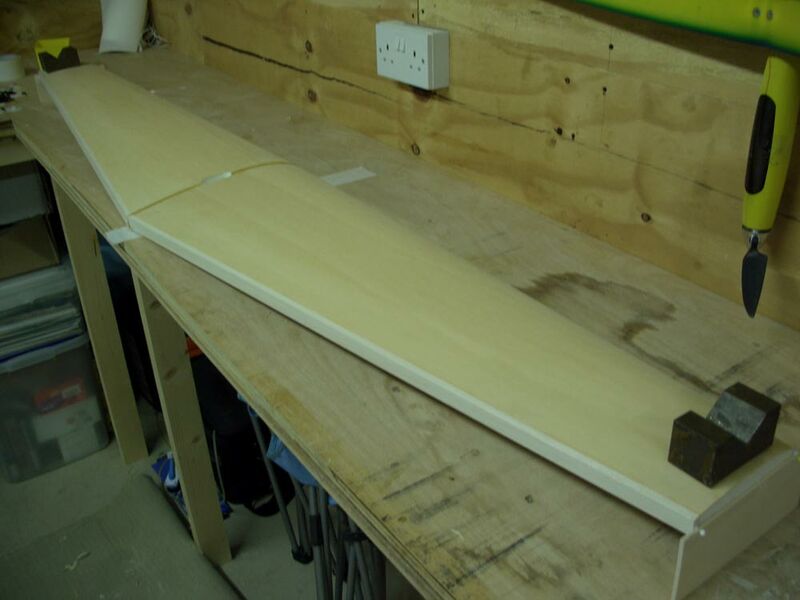 Tailplane sanded to shape, one thing here and it applies to the fin, don't glue the ends until you have sanded the hinge edge to a 45 degree otherwise you will have trouble getting it right at the tips. The first shows the servo covers glued in place. A lot easier than removable covers. The second shows my choice of control horn. 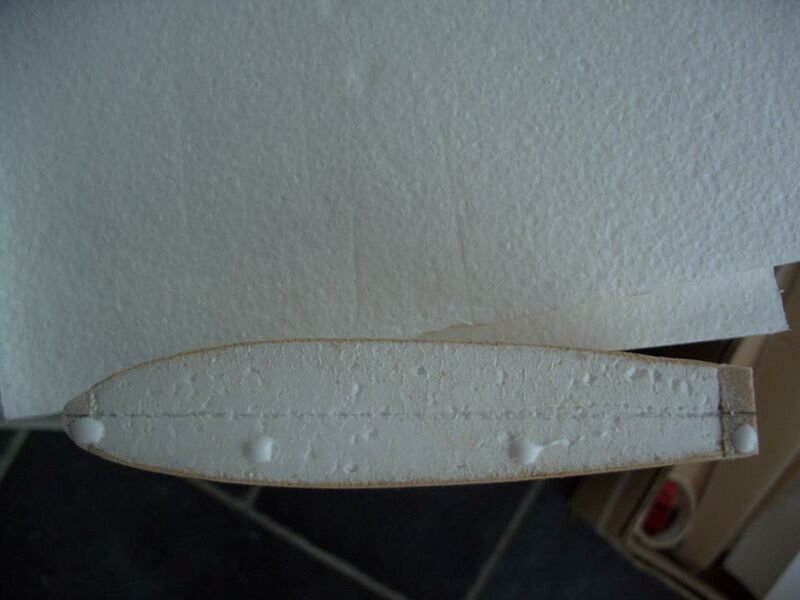 These are from Giant Cod and are screwed through the ply hard point and epoxied onto the aileron. No surprises here except I have run a 2" strip of glass over the undercarriage blocks. The wing hard points are definitely better fitted before glassing. 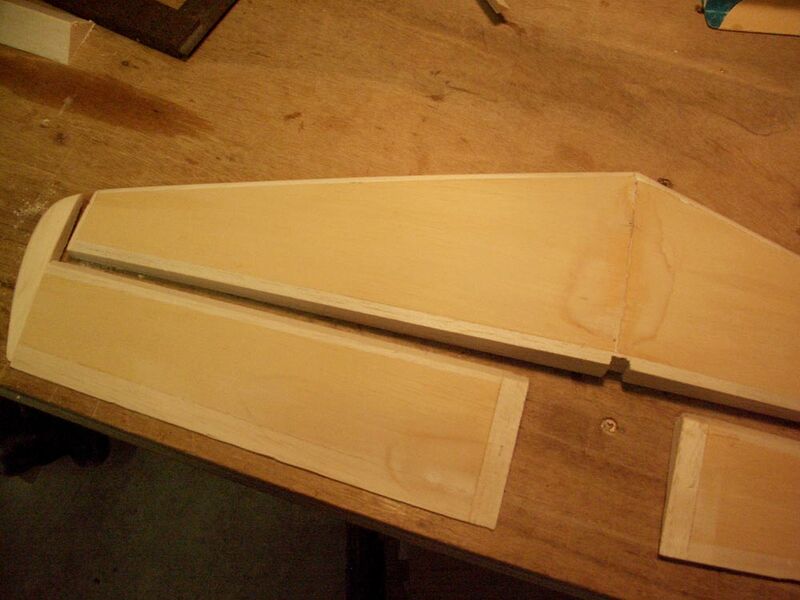 Again I'm departing from the instructions here for the fitting of the wing joining hard points. The instructions say to fit these after the centre section glass has been added, but I'm drilling them and fitting them before so that the glass seals them in good and proper. 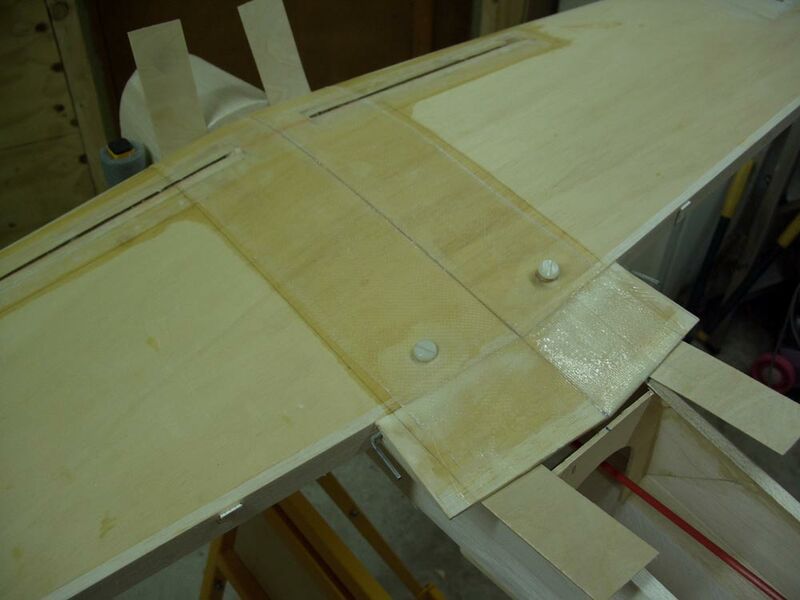 When sanding the ailerons & flaps to maintain the section I took them down to a feathered edge. 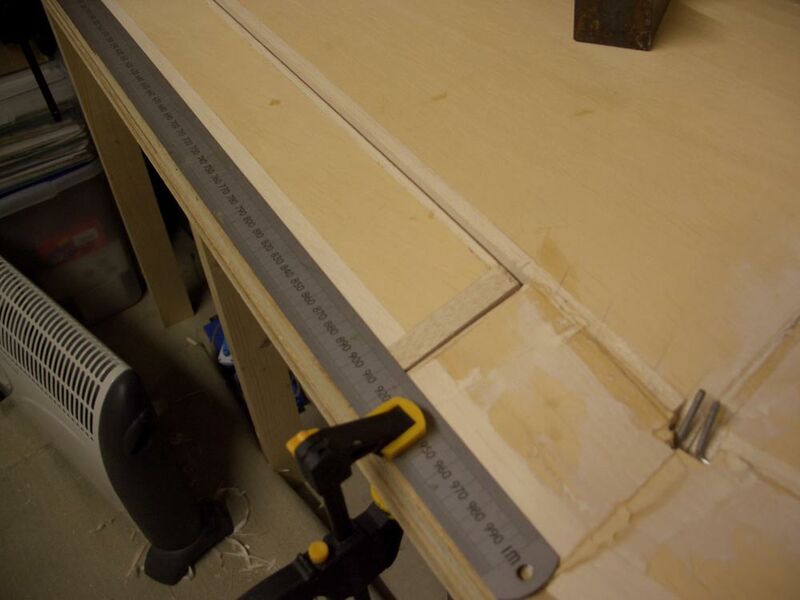 so now with everything all lines up I trimmed the entire training edge to a more sensible 1.5mm thickness. 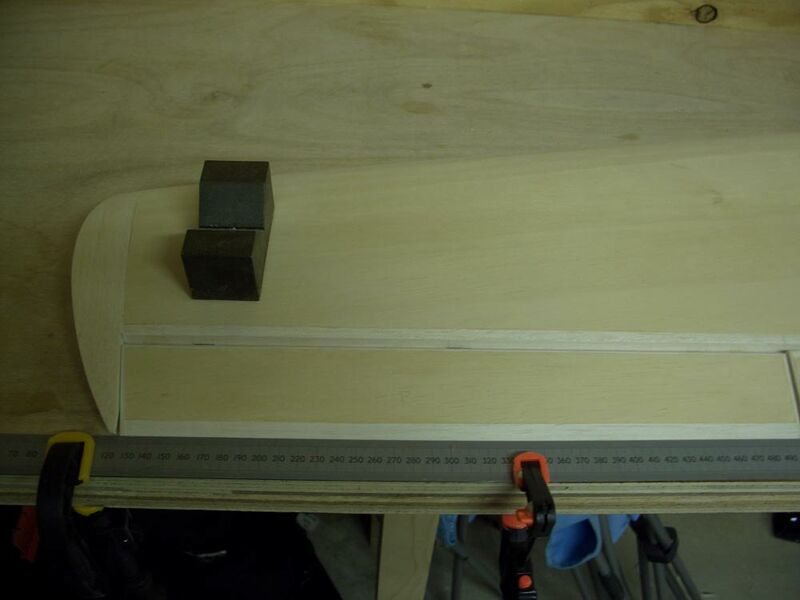 This has made the the chord by the plan about 3mm too short, but given the paper plans can stretch and there is no measurement given, its fine, and the edge looks good. I looked at this for some time and in my mind I couldn't see how the instructions would work, but going with the Galaxy method I went with it, and guess what, the method of installation and operation doesn't work. The geometry is all wrong, as the flap torque rods move down because of the angle of the wing, they want to move apart, but can't because of the ball joint. 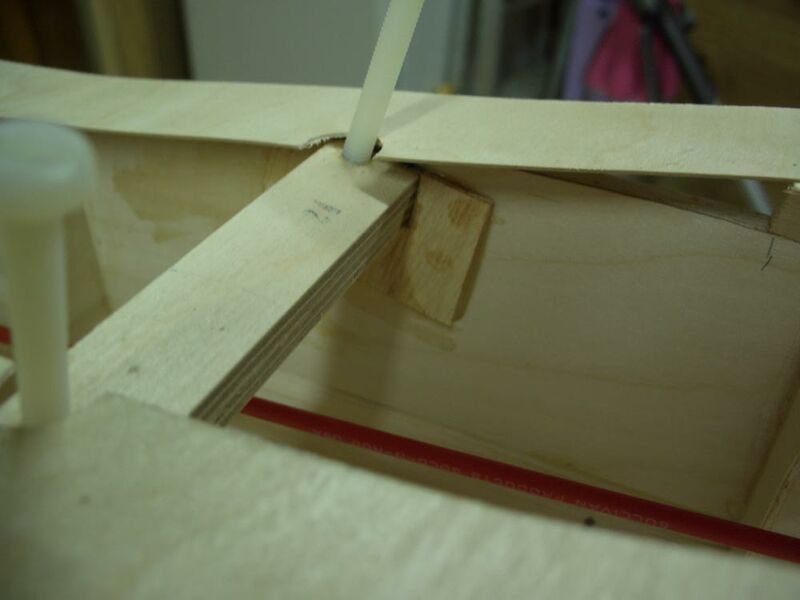 Even removing the ball joint doesn't fit the problem because you cant get enough downward movement on the flaps. 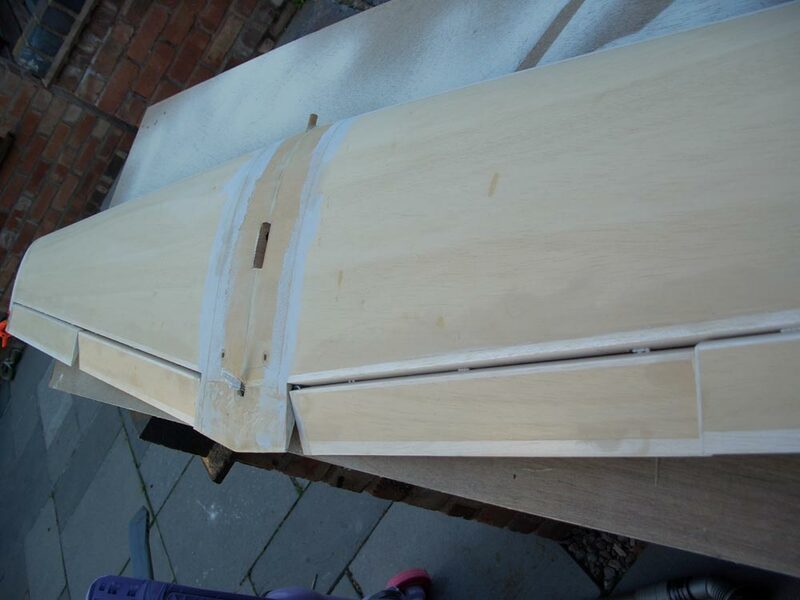 The flaps are faces with 6mm balsa, chamfering this and hinging at the top as recommended doesn't give enough downward movement. 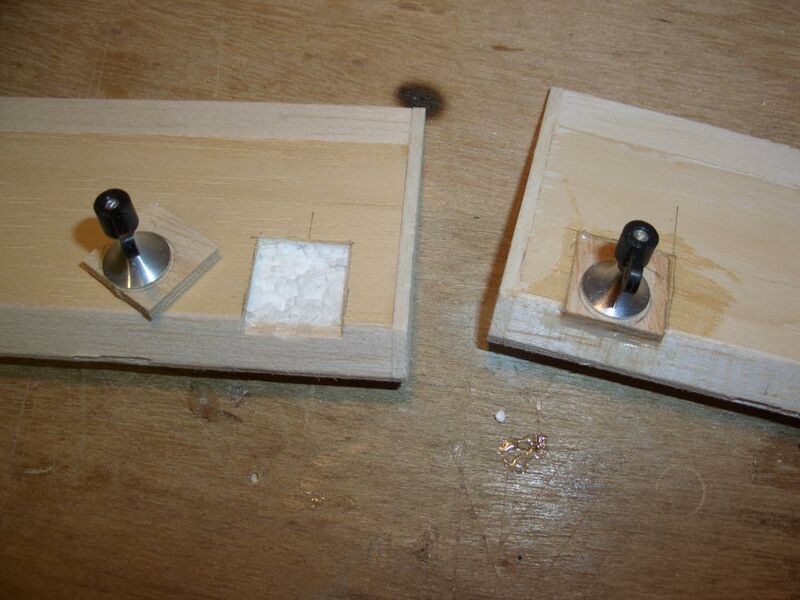 Because the root blocks were drilled during the first attempt they were replaced. Had I remembered I could have taken the extra 1/2" off of the flap, but I forgot, so they remain 1/2" to long. 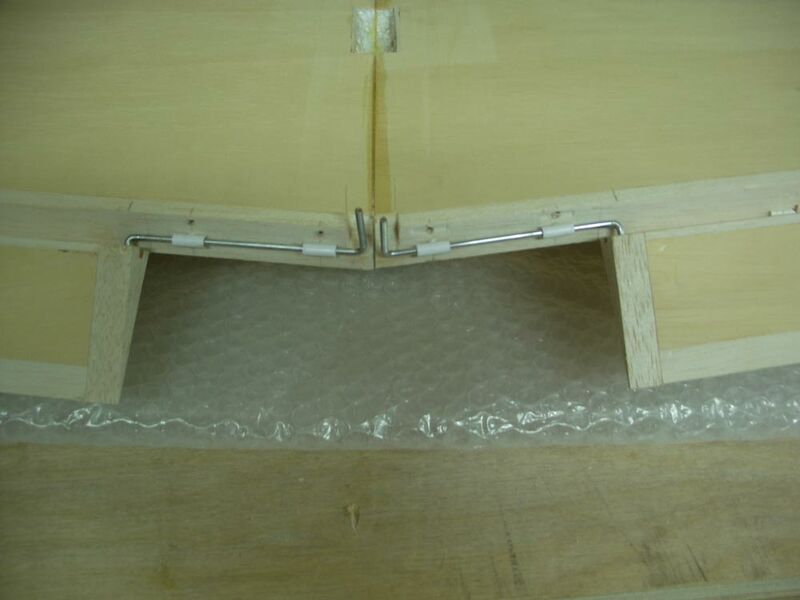 I positioned the torque rods on the trailing edge centre line and hinged the flaps (With proper hinges) on the bottom. Now because the centre lines are different the torque rods will want to move in the blocks, as the flap goes down the rods will move out. To facilitate this I (luckily) found some carbon tubing that I made a bearing with. To make it easier to get everything aligned, I made the hole in the bearing block a little bit bigger than the O/D of the carbon rod bearing, using slightly more epoxy than I needed I fitted the bearing and assembled the flap, the bearing dried perfectly aligned and any gap was filled with epoxy. 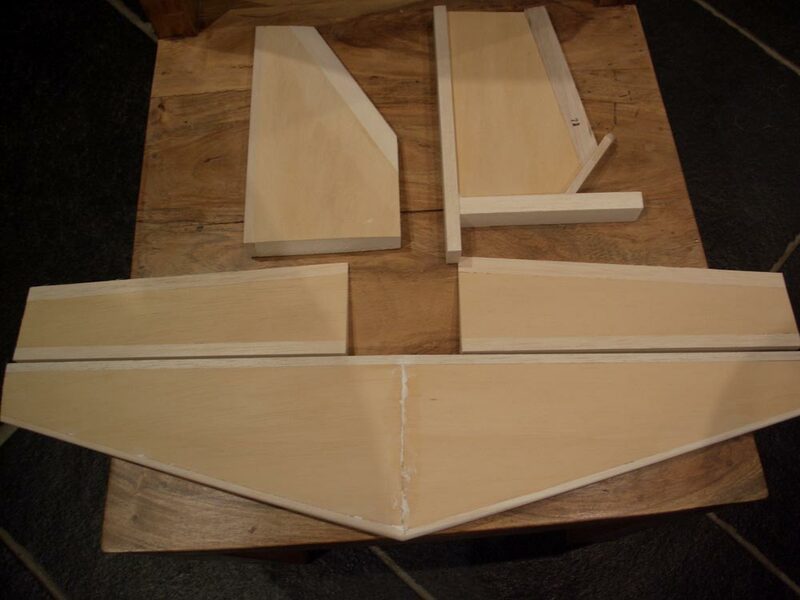 Most (if not all) the flap movement will be down, but I chamfered the flap L/E to match the ailerons so they looked the same, and this will allow me some degree of reflex if I find I need it. 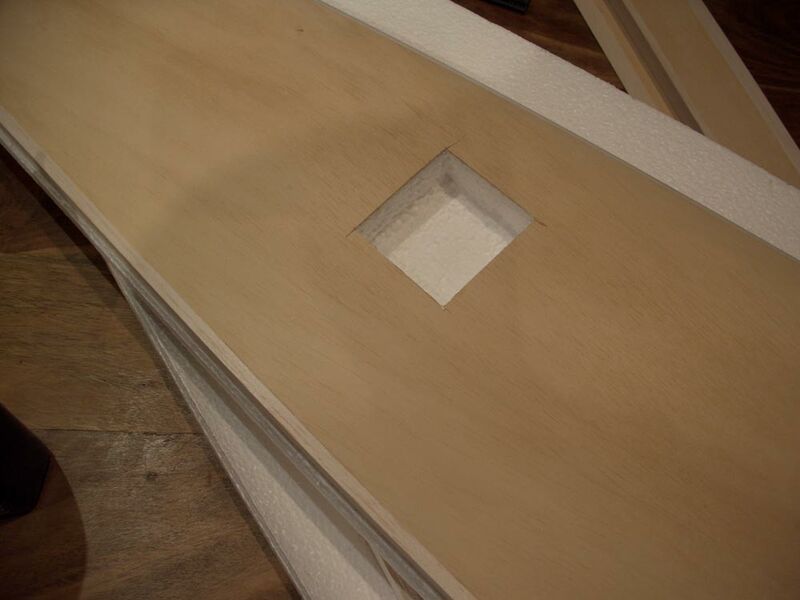 The centre section was slotted and glued in place, and the entire T/E aligned just to make sure. 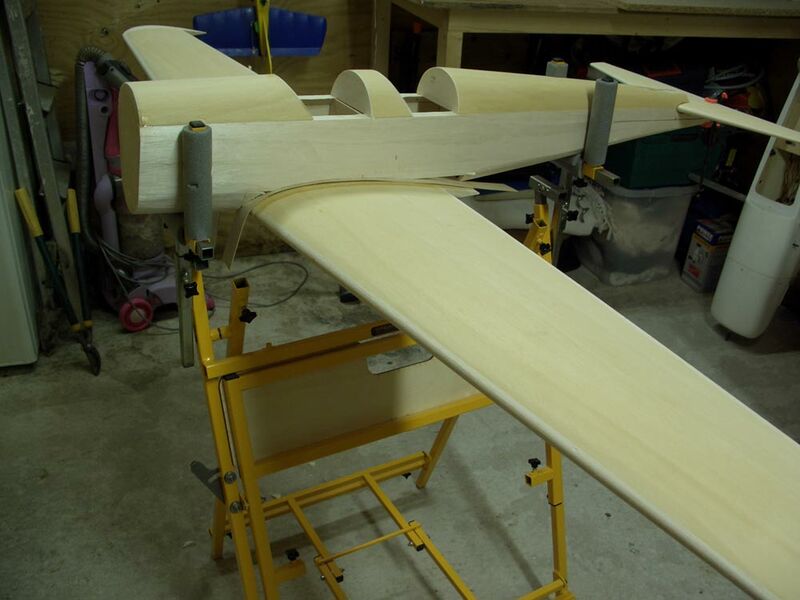 Temp fitting of the ailerons to give me the line to sand the wing tips to. One thing to note, and I missed it. 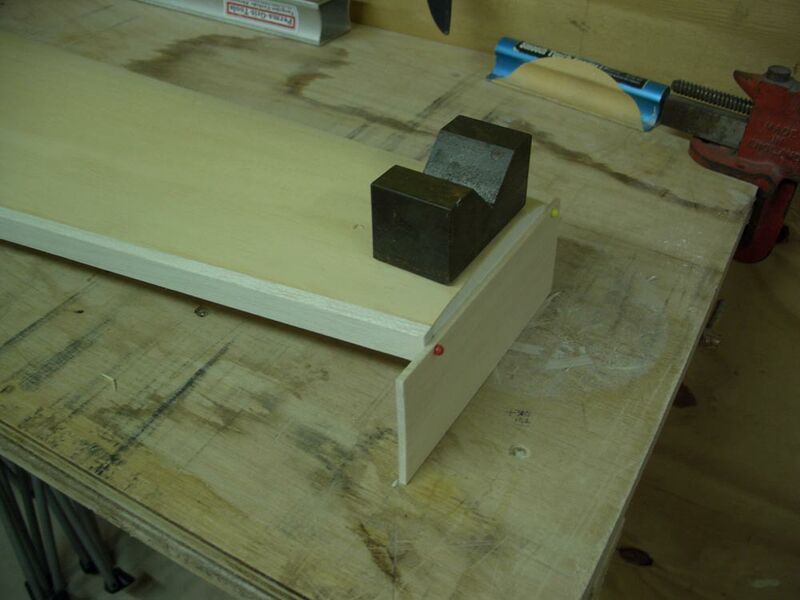 There is a 1/2 " block for the flap torque rods, to this extra half inch has to be removed from the flap. I didn't ad as can be see above the flap and hence the aileron is too long. All I did was take an extra 1/2" off the centre section. I mentioned earlier that I did not fit the wing tip as I needed to join the wings first. This is the best way to join wings to keep any errors out of the final assembly. 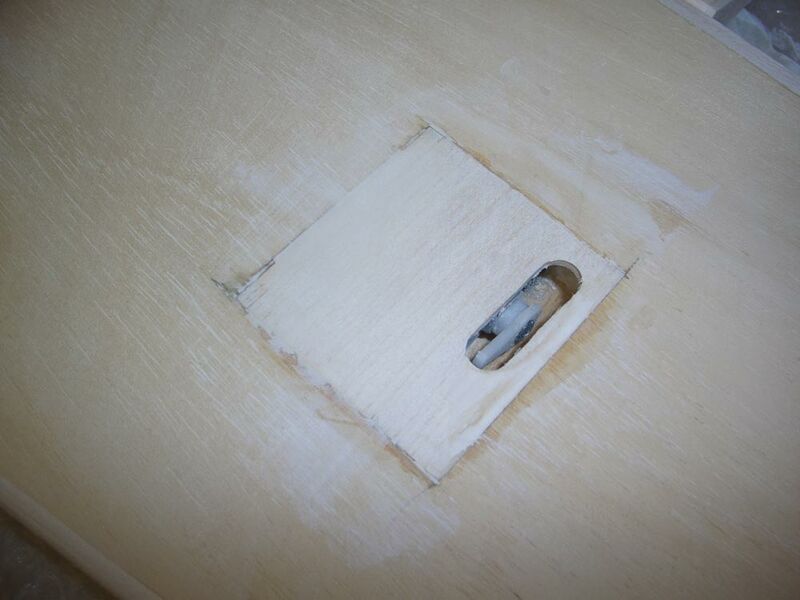 Draw a line through the centre of the wing tip here you can also see some small glue blobs. 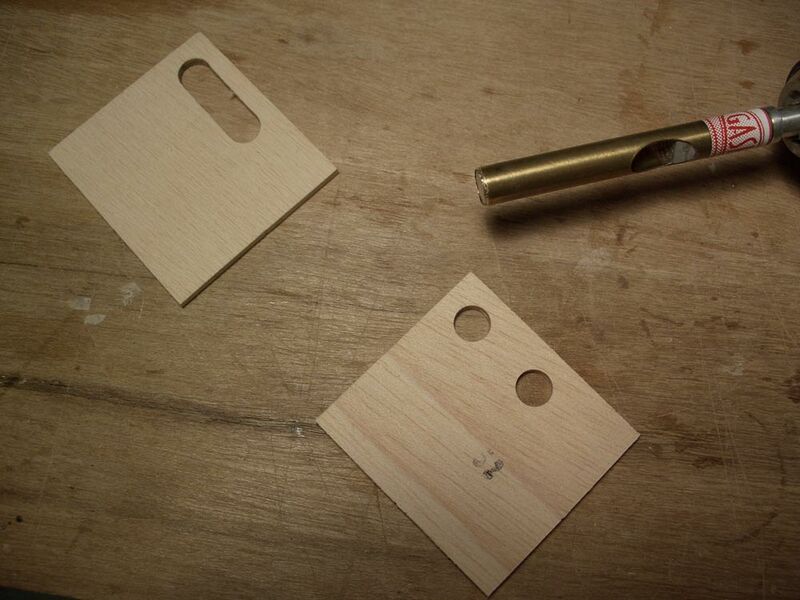 Make a parallel jig which is as deep as the required dihedral, plus the distance from the skin to the centre line. 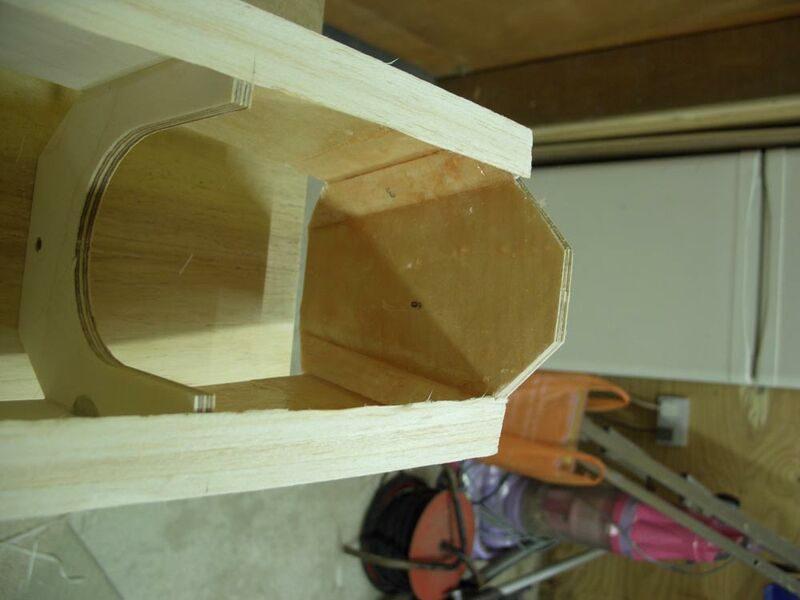 The plan calls for 2" dihedral under each tip, so my spacers are 2.5". Make 2 and temporarily glue them to the wing tips. 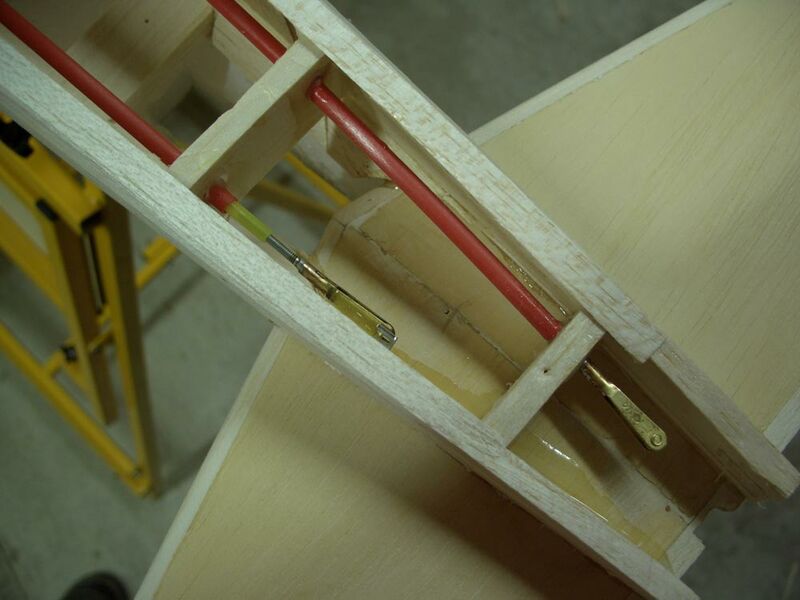 With the wings on a perfectly flat surface hold down the tips; what this does is it makes sure the tips are parallel but more importantly they are exactly in the same plane. Any errors will now be at the centre join. There is nothing you can you about this, but the errors will have a lesser effect that if it was at the tips. I'd suggest that if there is more than 5mm error between the 2 panels you request another pair from the manufacturer. These panels are very good. 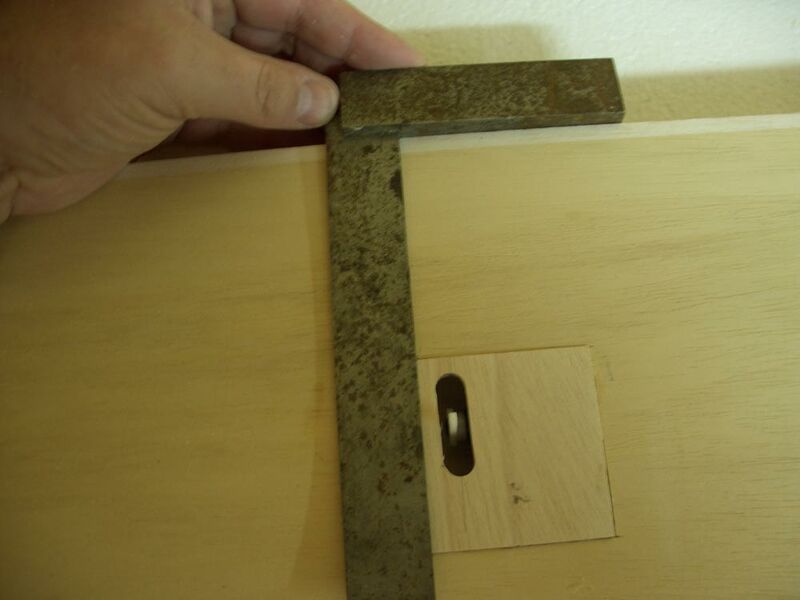 Sand the roots to the correct angle and glue as normal. 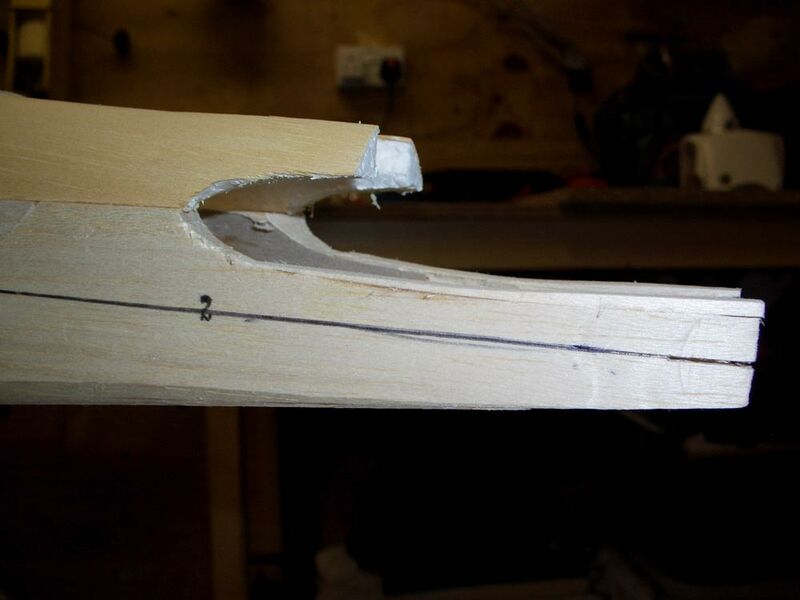 Once dried the jigs can be snapped off and the tip cleaned up and the tips fitted. 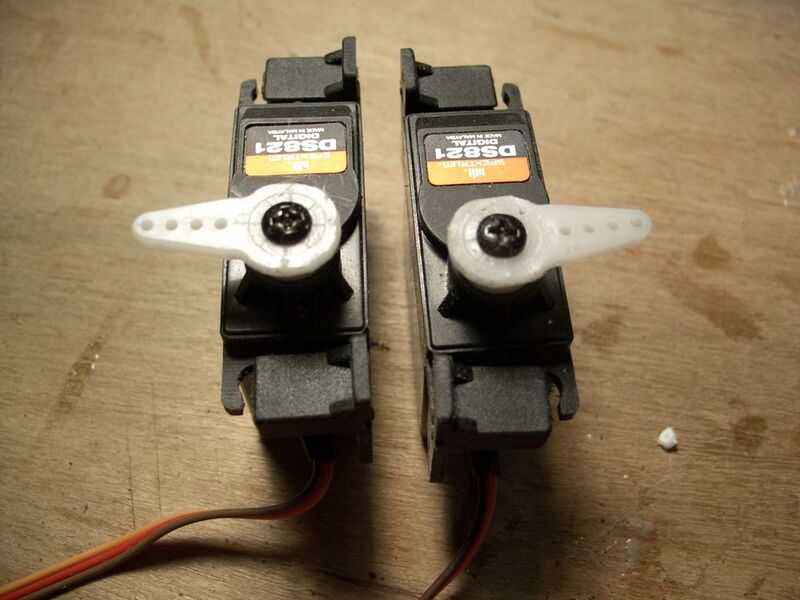 I always take time getting my servos ready. 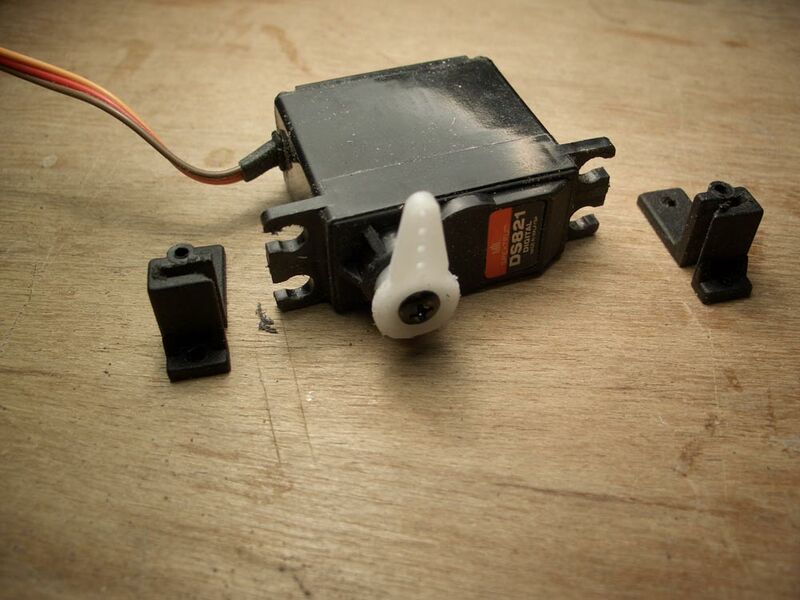 Its all too easy these days to stick any servo in a model and use the transmitter sub trim to centre the servo. I like to take 5 minutes and get the servos as near to centre buy moving the servo horn on the spline. 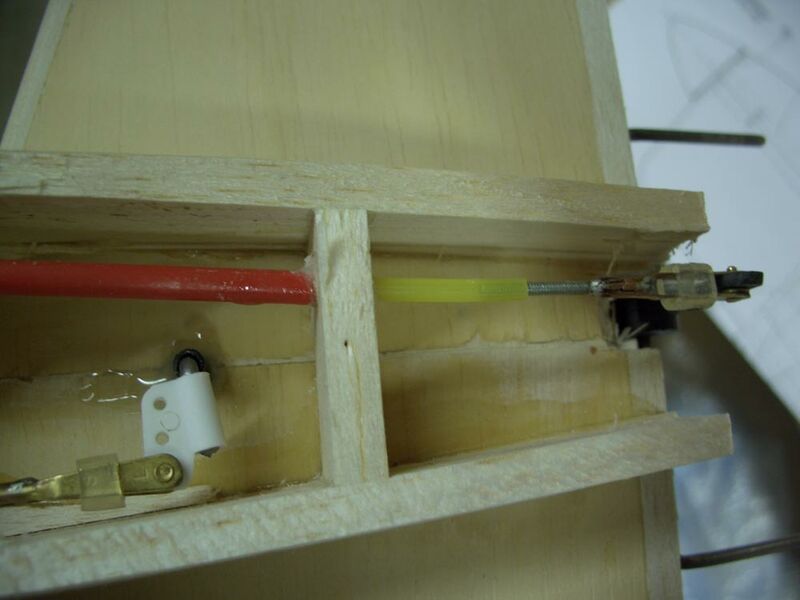 The first picture just shows the servo in the wing box, just to check the fit. 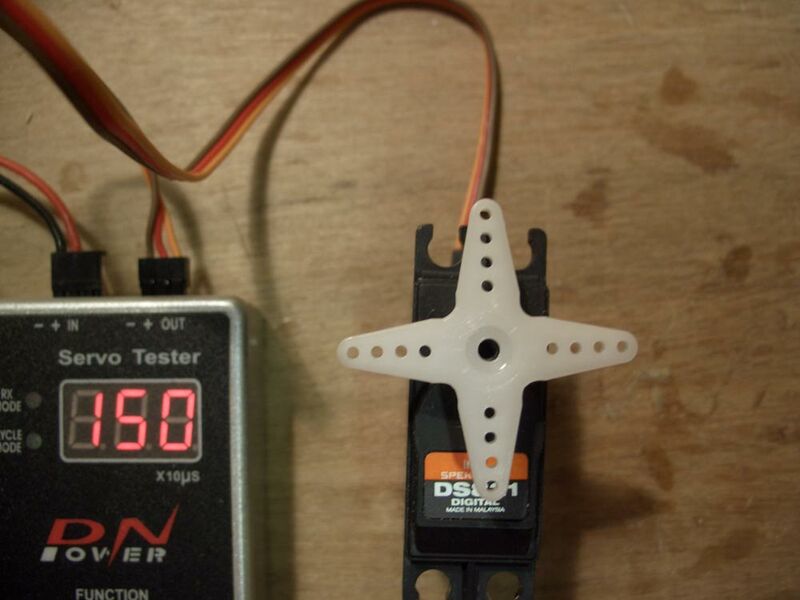 The second picture shows a servo tester generating 1.5mS pulse - You can use your transmitter to do this, but make sure there is no Sub Trim dialed in. The photo doesn't show what we are looking for but if the horn is moved on the spline the horn can be slightly offset. What I look for is the best position. I cut the unused horn arms off, and neatly sanded the stubs, Its just lazy to keep the cut ends unfinished. 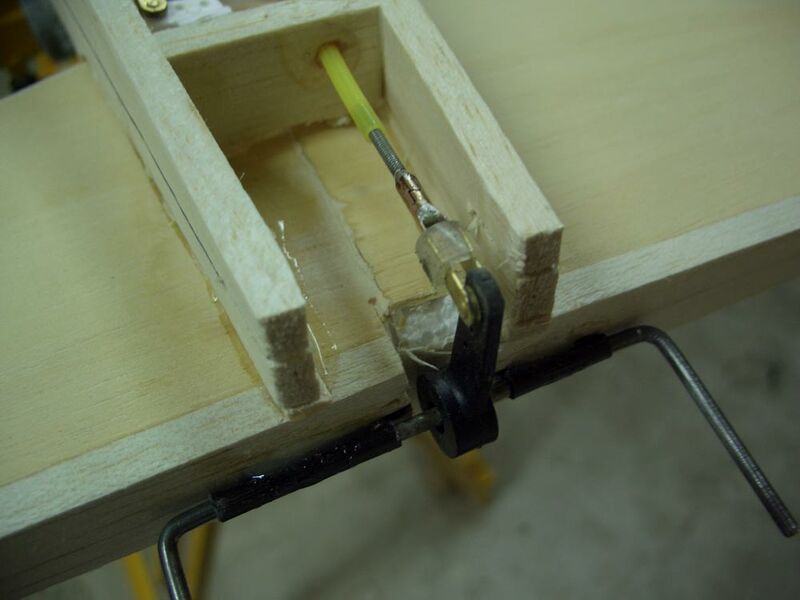 Using a Gaskin Softbore make the holes in the servo cover and slot it out. The final image shows the horn at 90 degrees to the control surface. 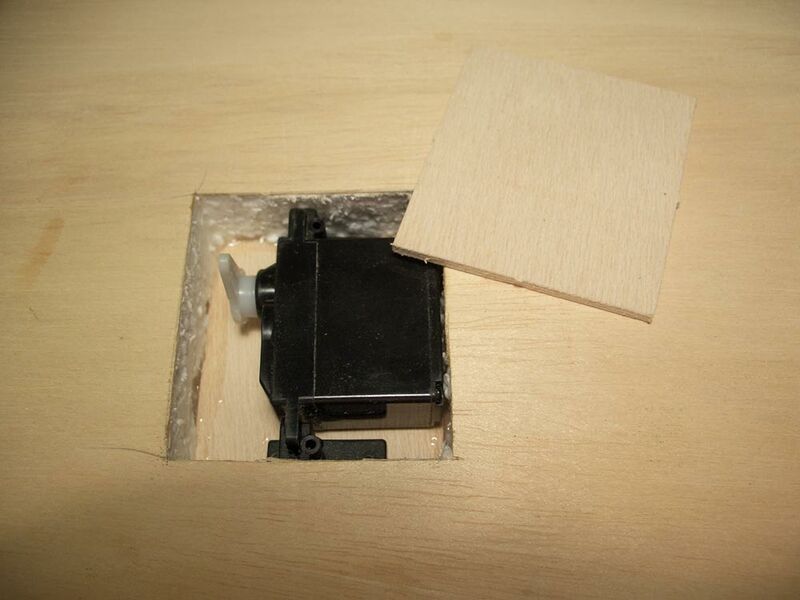 I intend to depart from the instructions here, they say to make a box with a removable lid, which is screwed into place, I intend to just glue the lids in place with the servo. 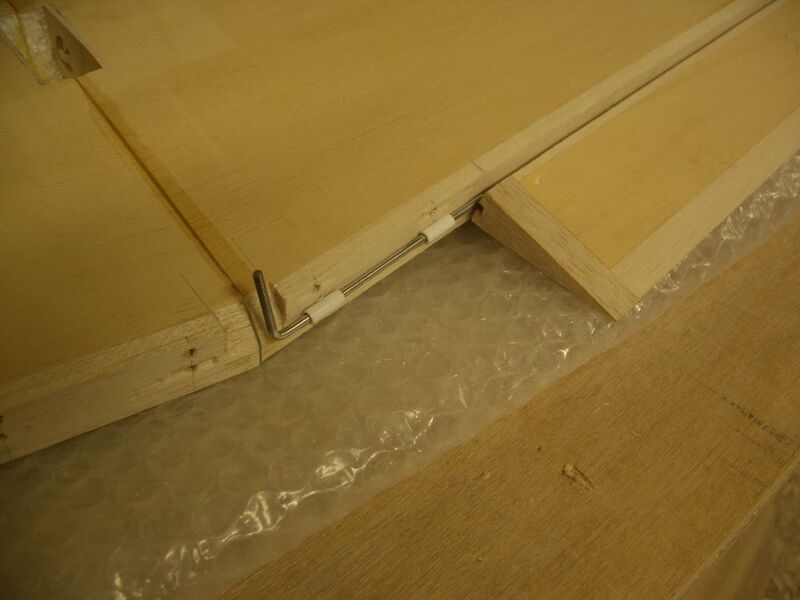 You will need a big clamp to pull the nose together. As there is so much force just on the glue joints, I fibre glassed some glass cloth around the nose area, must to make sure. I extended the wing servo holes to accept a standard servo, and installed the undercarriage blocks (no photo of this). 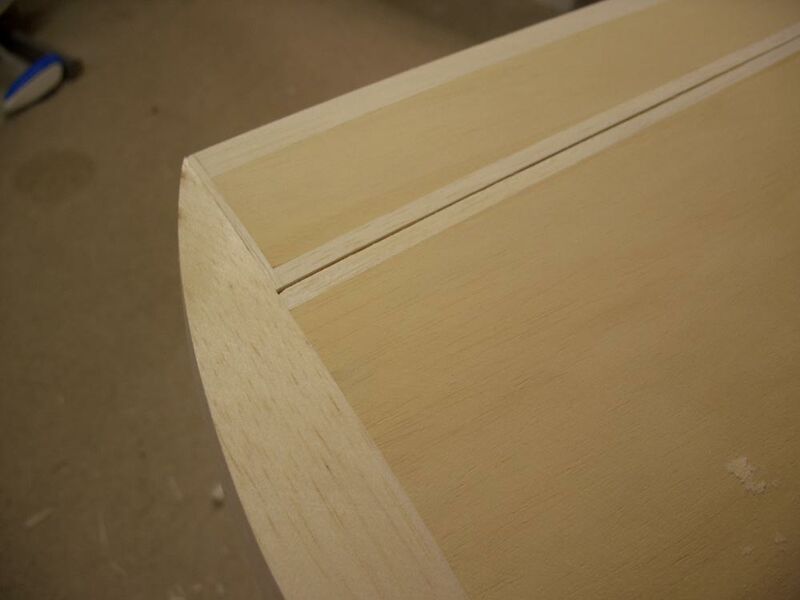 The boring bit, facing off the foam blanks and sanding to shape. The instruction say to fit the wing tips at this point. I'll not add them just yet as it will hamper the wing joining. 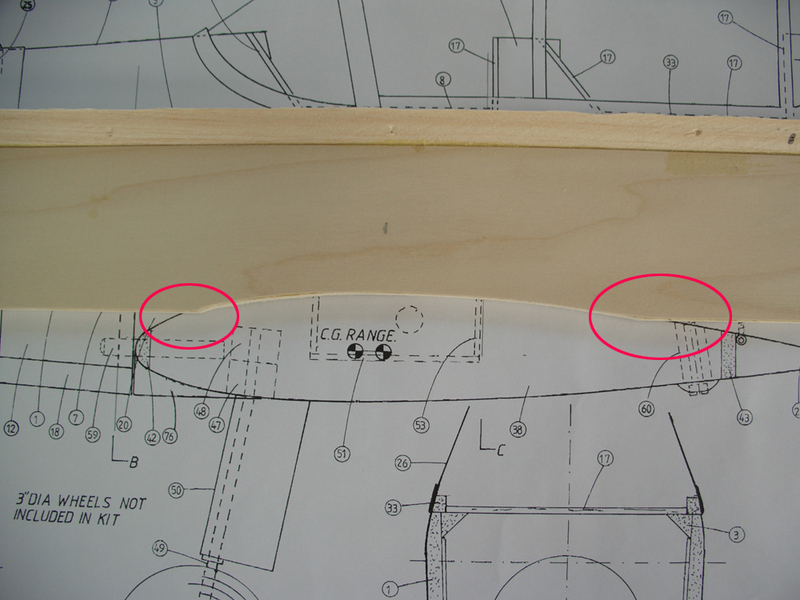 Care must be taken to keep the ailerons & flaps with their respective wing, and the orientation must be maintained. I.e. do not turn the ailerons or flaps over else the camber of the wing will be wrong. 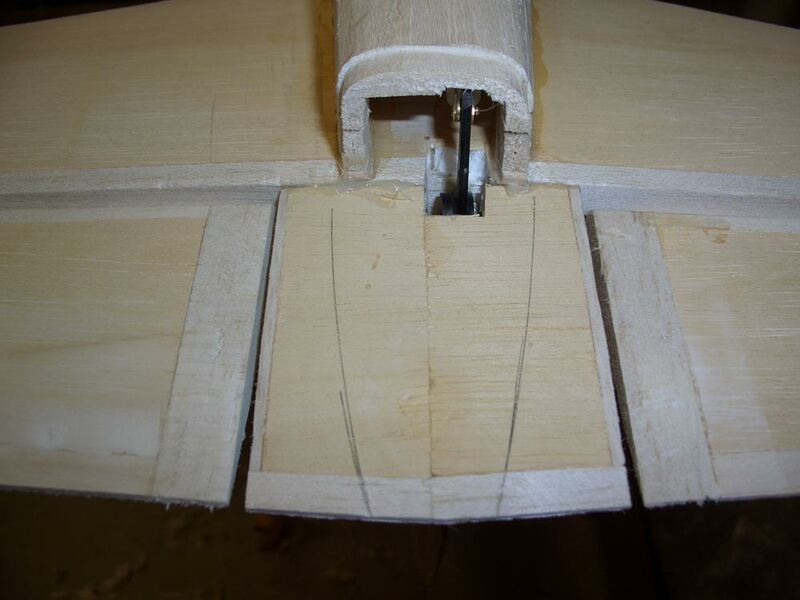 Doublers added as per instructions, there is a discrepancy between the plan and the pre cut wood in that the wing seat does not match the plan. As the plan can stretch I'll go with the wood for now and see where we are later. In any event I'll check the incidence at wing fitting time. The instructions say to drill the firewall to take the engine mount, I'll do this later when I fit the engine & cowl. 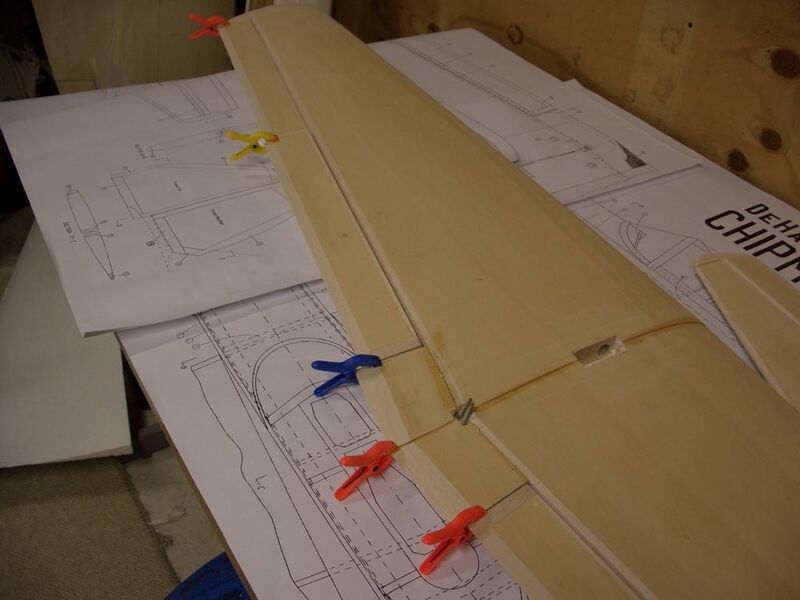 Fuselage in jig being joined.